The panhard rod kit that you have purchased is designed for use with regular disc wheel tube axles only. In some instances the disc wheel tube axle may have been modified to accept wire wheels. Be sure that you are attempting to install this panhard rod kit to the correct tube axle assembly. 2- 14" black tie wraps. 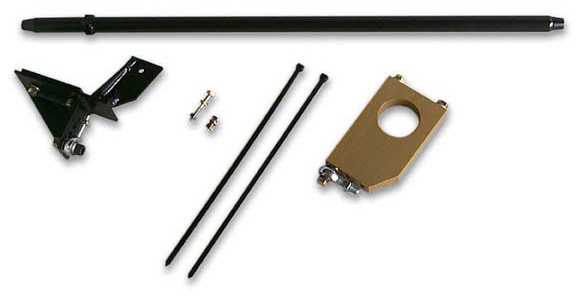 If your hardware kit contains more accessories than this item, you have the wrong panhard rod kit. Since the actual panhard rod bar contain in this kit is longer than that of the wire wheel, please return the entire kit to your supplier. DO NOT ATTEMPT TO INSTALL THIS KIT. The 2 black 14" tie wraps are provided as an additional precaution to prevent the inner handbrake cable (prior to 1977 model tube axles, without metal handbrake compensator assembly) from hanging up on the panhard rod bracket. Simply join the tie wraps together, with the inner handbrake cable within, and wrap around the axle tubing. Do not overtighten when joining tie wraps together. Please follow panhard rod installation instructions carefully.